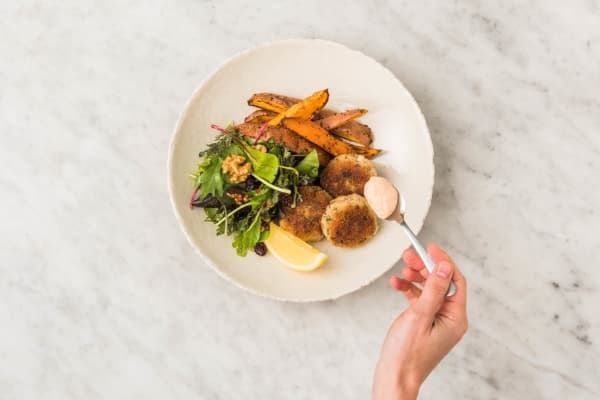 Crab cakes are like an express ticket to dinnertime luxury. These prepared patties just need a quick sear in the pan to bring out their brilliant flavor. 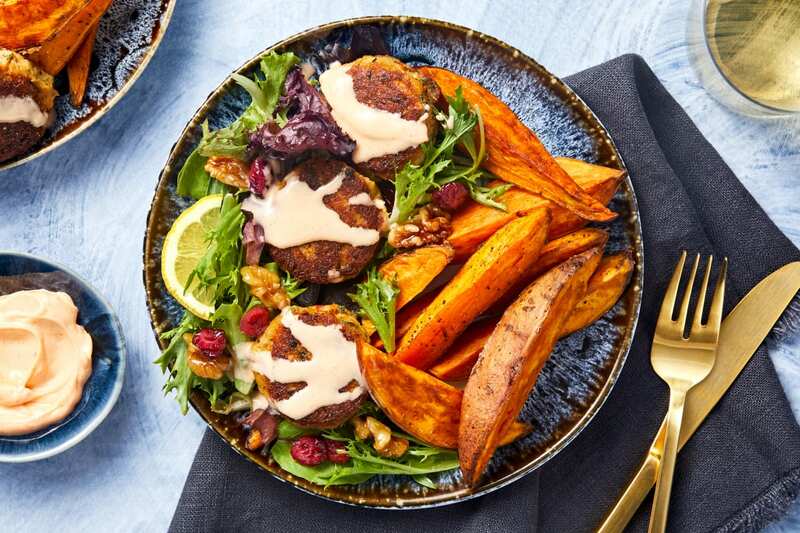 But they aren’t on their own when it comes to delivering simple deliciousness: not only are they dressed with an impeccably creamy lemon paprika aioli, they also come with an autumn-appropriate cranberry walnut salad and warm, toasty sweet potato wedges that just need a bake in the oven. Wash and dry all produce. Adjust rack to upper position and preheat oven to 425 degrees. 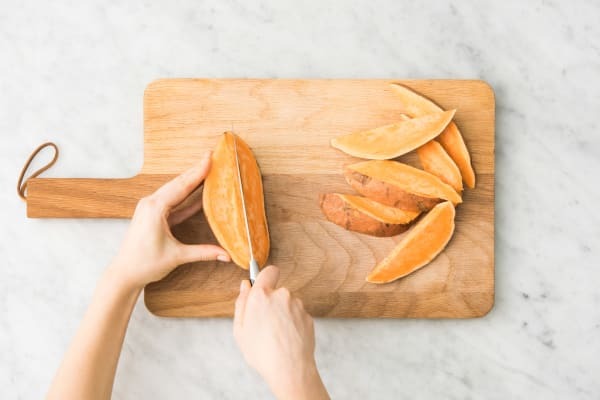 Cut sweet potatoes into 1-inch-thick wedges. Toss on a baking sheet with a large drizzle of oil, half the fry seasoning, and plenty of salt and pepper. Roast in oven until browned and tender, about 25 minutes. Meanwhile, place cranberries in a small bowl. Cover with hot water and set aside. Place 1 TBSP sugar and ¼ cup water in a large nonstick pan; stir to combine. 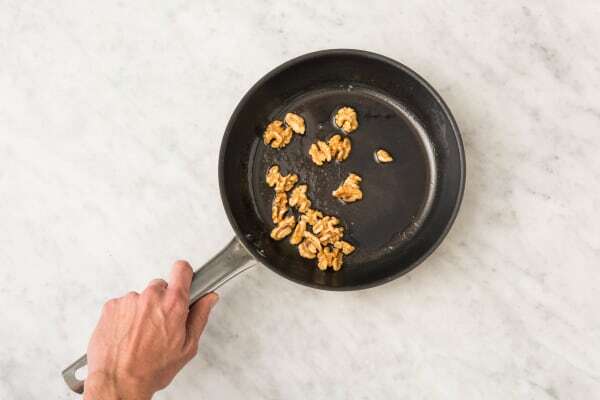 Heat over medium-high and toss in walnuts. Bring to a boil and cook, stirring occasionally, until nuts are coated in a sticky glaze, 3-4 minutes. Transfer to a plate. Grate or finely mince garlic. Zest 1 tsp zest from lemon, then cut into wedges. 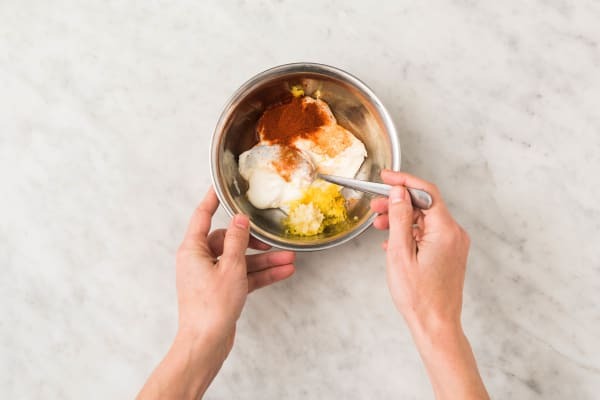 In a small bowl, combine mayonnaise, lemon zest, 1 TBSP lemon juice, and ¼ tsp paprika (we sent more). Stir in garlic to taste. Season with salt and pepper. TIP: Give mixture another taste and add more lemon juice or seasoning if needed. Gently pat crab cakes dry with a paper towel. Season all over with salt, pepper, and remaining fry seasoning. Rinse and wipe out pan used for walnuts. Heat a large drizzle of oil in same pan over medium heat. Add crab cakes and cook without disturbing until crisp and browned on bottom, 4-6 minutes. 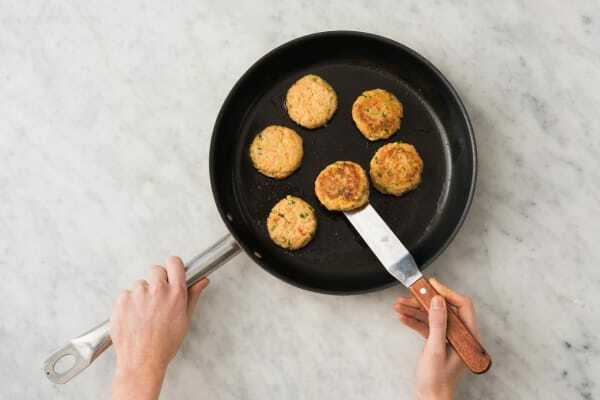 Gently flip crab cakes and cook until lightly browned on other side, 2-3 minutes. Add 2 TBSP butter to pan and swirl to coat crab cakes. Cook until browned, 1-2 minutes more. Remove from pan and place on paper towel to drain. Season with salt and pepper. 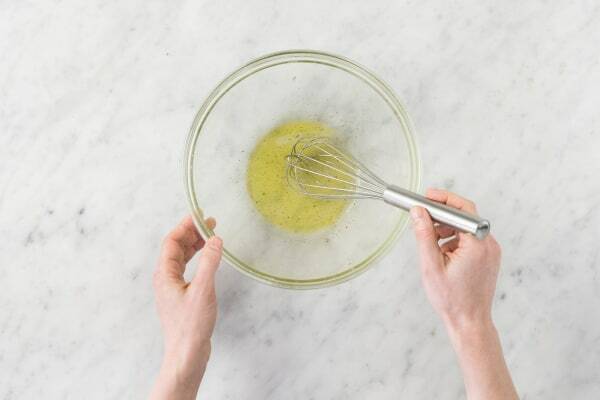 In a medium bowl, combine a large drizzle of olive oil, a big squeeze of lemon juice, and a pinch of salt and pepper. Toss lettuce, walnuts, and cranberries (draining before adding) into bowl with dressing. Divide crab cakes, potatoes, and salad between plates. Dollop crab cakes with some of the aioli. Serve with remaining aioli on the side and remaining lemon wedges for squeezing over.